In case you’ve been unable (unwilling?) 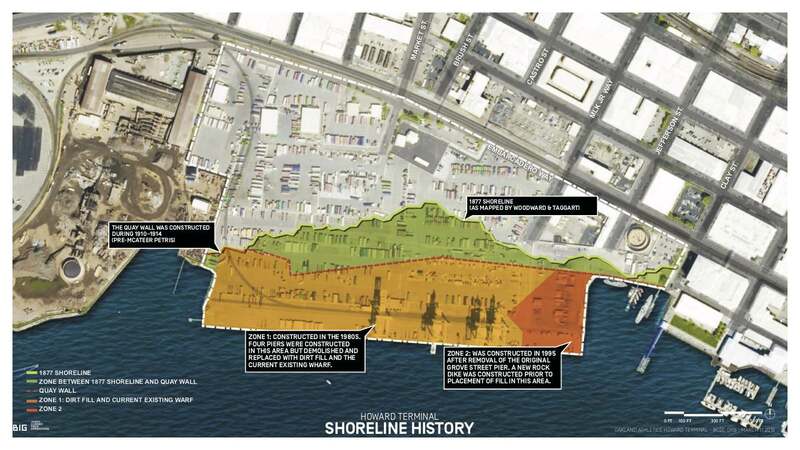 to peruse the presentation given to the BCDC on Howard Terminal last week, go get it. Now. While you’re waiting for that to download, I’ll go through some of the important slides. 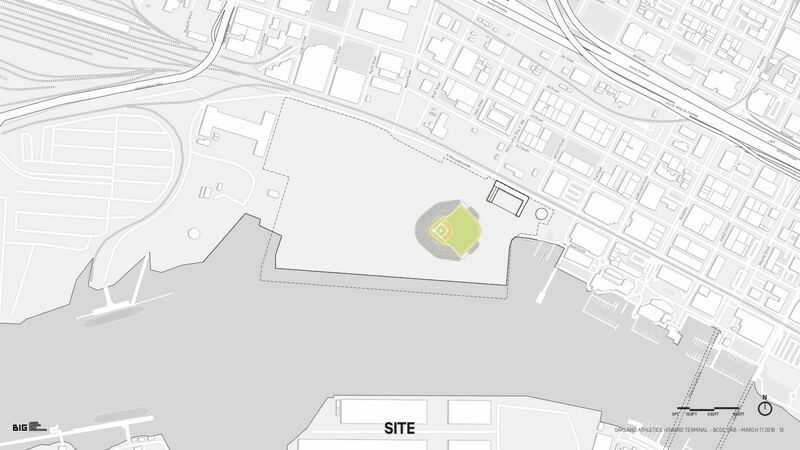 First, let’s look at how the ballpark is situated on the 55-acre site. That’s a lot of space to the west, right? While there won’t be splash hits, it looks pretty snug in the Southwest corner there. From the looks of things, BIG may have placed it as far southeast as possible while maintaining the orientation and the preferred street grid. Street grid, you ask? There’s one of those, too. All the blank space is filled in, with streets and potential heights for ancillary buildings. Most are up to 200 feet tall, some are 300 feet tall, and one is listed at 400 feet tall. What would that look like if you were standing on the shoreline? The next slide should give you a sense of it. This will be the one of many red flags for a lot of people. Nothing in the Jack London Square approaches that scale. Even the ballpark, which by itself would be the tallest building in the neighborhood, is absolutely dwarfed by the condos and suites to the west. Like what happened with Brooklyn Basin, location is everything. And this location is on the shore. In the image above you can see how much the shoreline has changed, from the 1877-surveyed shoreline in green to the extended beach and wharf area, completed over 20 years ago. The sticky part is that the orange areas were built for port commercial purposes, not for housing, parkland, or office buildings. 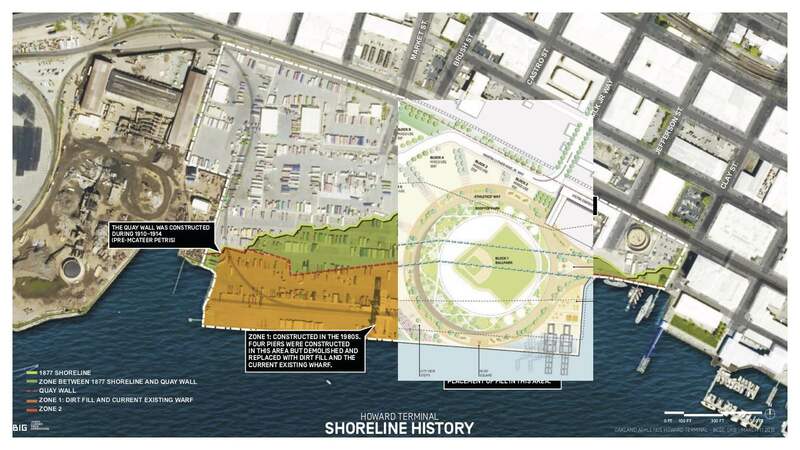 I overlaid the ballpark site to get a sense of where it would fit in a historical context. The problem here is that the ballpark will be on bay fill. Will the BCDC and the State approve a completely different purpose for the land? We have two historical cases of this. At China Basin it worked out for the Giants. At Piers 30-32 the Warriors faced resistance and moved their concept a mile south. One other thing to consider is the lack of public space. The second image in the post, titled Open Space & Public Access, shows which areas would be available. The concept for this goes back all the way to the original Fremont concept in 2006. I’m guessing there are 12-15 acres available, plus the roof deck, which I calculate to be 1.5-2 acres on its own. For reference, Brooklyn Basin is 64 acres, of which 30 acres is set aside as open space. 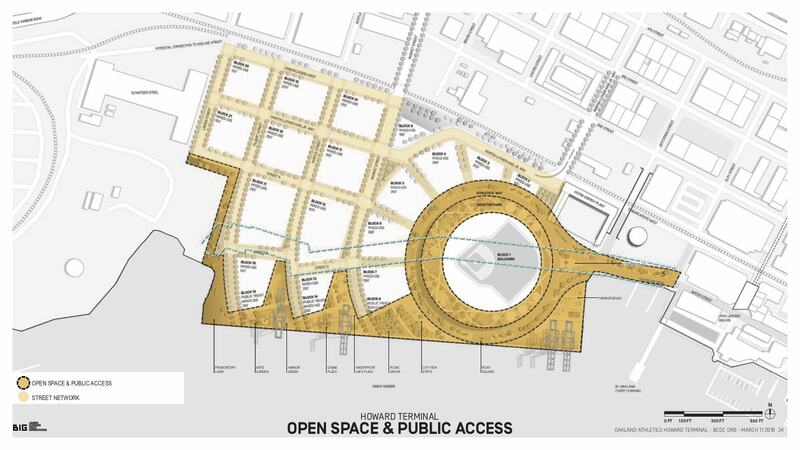 I don’t see how the amount of open space identified for Howard Terminal will pass muster, unless everyone decides that the overriding necessity is the new housing over everything else, enough to indirectly subsidize the ballpark. This entry was posted in Athletics, Baseball, Howard Terminal, News, Oakland, Owners. Bookmark the permalink. All good points. Excessive height will block views for property north of the Howard Terminal, lack of open space in the blocks to the west will make them less desirable, shadowing a big concern, lack of adequate buffer adjacent to Schnitzer Steel, poor public transit will make it the Levi Stadium to the north, super blocks will encourage massive block like buildings like what is going up on Brooklyn Bay, street orientation will exacerbate the wind and cold. Why is it oriented East? Doesn’t MLB want North/South orientations? MLB prefers East-Northeast orientation. Several parks include domes stray from that. The big issues are providing shade for fans and keeping the sun out of the eyes of batters, and to a lesser extent, outfielders. Can they just hurry up and leave the bay and come to Sacramento already. Sactown doesn’t have the money, bro. When it’s justified. Not right now.